This article is about the British bus manufacturer. For the English football player, see Dennis Alexander. Not to be confused with Denis Alexander or Denis Alexander, 6th Earl of Caledon. Alexander Dennis is a British bus building company based in Scotland. The largest bus and coach manufacturer in the United Kingdom, Alexander Dennis has manufacturing plants and partnerships in Canada, China, Europe, Hong Kong, Malaysia, New Zealand, South Africa and the United States. In early 2016, Alexander Dennis had a 44% market share in the United Kingdom. As at April 2014, Brian Souter and Ann Gloag collectively held a 55% interest. Alexander Dennis was incorporated in May 2004 to buy and hold on behalf of a consortium, including David Murray and —in a private capacity— Brian Souter and Ann Gloag of Stagecoach Group, a major portion of the collapsed Mayflower Corporation. Mayflower had bought Scottish bus-makers, Walter Alexander, in August 1995 and English bus-makers, Dennis Group, in October 1998. To reduce overheads Mayflower had joined Henlys Group in a joint venture rolling Alexander, Dennis and Henlys' Plaxton into one corporate unit with many factories all under the name TransBus International. The venture was not successful and Mayflower collapsed in March 2004. At that time Henlys' Plaxton was taken by its own management and operated under the ownership of Plaxton Holdings. Three years later, in May 2007, Plaxton Holdings was bought by Alexander Dennis. The former Alexander Belfast plant was not included in the deal with Mayflower and closed but Alexander Dennis ultimately inherited a number of plants: the former Alexander factories in Falkirk, Scotland; the Dennis factory in Guildford and later the former Plaxton factories in Anston and Scarborough. The former Northern Counties factory in Wigan completed outstanding orders for its President body and closed in January 2005. Dennis Group had produced a range of both bus and coach chassis and bodies as well as fire engines. Included among its range of chassis were the Dennis Dart, one of the all-time best-selling buses in the UK, and the Dennis Trident. They also produced export variants for service in Hong Kong, New York City and other locations. The Dennis Trident is the most common bus model in service in London. Plaxton made coaches as well as two double-decker bodies (the Plaxton President and the Alexander ALX400), the Alexander ALX300 citybus and the Pointer body built in quantity on the aforementioned Dennis Dart chassis, which replaced the Alexander ALX200 body built previously on a Dart chassis. Alexander Dennis secured a number of major orders from UK operators. The company also continued to find success in its predecessors' traditional markets of Hong Kong and the Republic of Ireland, with the Enviro500 securing orders in both markets, and the ALX400 double-deck body remaining the Dublin Bus standard vehicle until production ended in 2006. Alexander Dennis is also building its share of the North American market, securing £25m worth of orders in 2005 for its Enviro500 model from customers in Victoria, British Columbia, New York City (open top models), San Francisco and Las Vegas. Beginning in 2008 ElDorado National began to assembly Enviro500 for US market and beginning in 2015 Alexander Dennis established an assembly plant in Vaughan, Ontario for orders to Metrolinx. 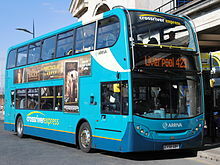 In 2006 the company unveiled two new models, the Enviro400 double-decker and Enviro200 Dart midibus. In May 2007, Alexander Dennis purchased Plaxton, thus reuniting the two former TransBus businesses. In May 2012, New Flyer Industries and Alexander Dennis announced a new joint-venture to design and manufacture medium-duty low-floor bus (or midi bus) for the North American market. New Flyer will handle production and marketing, and Alexander Dennis will handle the engineering and testing. On 7 June 2012, Alexander Dennis acquired Australian bodybuilder Custom Coaches. However, in May 2014, Custom Coaches was placed into administration. In August 2014, Custom Coaches was sold to its former management. TransBus/Alexander Dennis built fire-fighting vehicles until 2007. The bodywork on a majority of the chassis are built by a neighbouring company, John Dennis Coachbuilders Limited.